Walking on the streets of New York City I recently passed New Pizza Town. Since I hadn't stopped to sample any new places, I took the first opportunity to go inside and try it out. It was a small pizzeria, with 4 tables to accommodate those who can't wait to eat their slice. After living in Florida so long I appreciated the simple elegance of approaching the counterman, ordering a slice and a coke, paying and walking out, slice in hand in under 3 minutes. Imagine the simplicity. The pizza was good. Fresh, hot, and delicious, just like it says on the ubiquitous white pizza box. Cannot tell you how many other times I ordered pizza from a place, with the same fresh hot and delicious written on the box, only to realize it was stale, cold, and repugnant. One of these days I hope to have a sit down discussion with the guys who make those boxes, and ask them why they continuously lie. I wouldn't come here for the "dining experience" but if you want a delicious quick slice, or if this is your local takeout/delivery joint, consider yourself lucky. I have heard from many of the other patrons who were eating there, that the service left a lot to be desired, but in my opinion, if you aren't in a rush, and enjoy the "old pizza joint" ambiance, you will grow to love the angry service and repeatedly return. Personally I would rather deal with the angry attitude of the pizza guy, then have to wait for some server to bring me my slice of pizza. 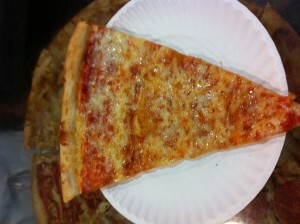 New Pizza Town in NYC gets 6 of 8 slices.